Please could someone tell me what this is? When you rub the leaves it smells lemony. I take it, it's okay to eat? 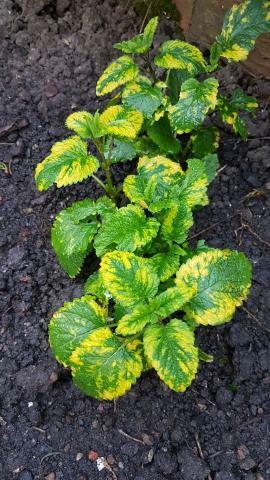 Definitely variegated lemon balm. Lovely thing but if you only have one plant (like I did) it did get swamped, unusual for lemon balm (ordinary) which is positively invasive! Yellow plant pigment assists by sending energy to chlorophyll A for more efficient use of sunlight. This is why plants with yellow leaves are able to grow, and grow well. It is white = absence of pigment that is a problem. Plants with white variegated leaves are slower in growth and there are no plants with pure white leaves. A recessive in corn / maize can create seedlings that lack chlorophyll. They germinate, grow while using nutrients in cotyledon, then die when no nutrient remains. Plants with purple leaves have chlorophyll "hidden" by anthocyanin pigments. Some plants begin spring growth with reddish leaves (some astilbe, for example) to protect tender new growth from scorching. There are plants with pure white leaves, just none that can photosynthesize their own sugars. Indian pipe (Monotropa uniflora) is fairly classic example. It's just getting its sugars from a mycorrhizal fungus which is getting its sugars from a tree. Indian pipe is not self-supporting. It is, essentially, a parasite. Very difficult to propagate too. Cultivating an albino offshoot of a redwood through root grafts is not how gardeners typically cultivate their plants. Seems more like "Look what I did!" Yes please, but no sugar, thank you, Frewen!